If you’re looking to achieve a great haircut at home or just want to cut your family’s hair, you need some of the best professional hair clippers on the market. These will allow you to get the perfect cut, every time, no matter what kind of hair you are cutting. It can be confusing buying a clipper for the first time, so check out these icons you can look out for when buying hair clippers. Power: Some clippers are powered by batteries, some are powered by rechargeable batteries, and some are powered by electrical cords. Cordless ones can be better for personal use, while corded ones can provide more power for professional use. Case: If you’re using your clippers at home, you may want a case to keep them out of the wrong hands, organized, and clean. However, if your clippers are just for your own use, a case may not be an important feature for you. Pieces: How many pieces come in your clipper kit is an important thing to know. We’ve included the trimmer and combs in our piece count, so you know how many attachments you are getting in every package. Adjustable Taper: An adjustable taper setting or comb can be a great feature if you are looking to create a really cool and tapered look. If this is not something you’re concerned with creating, this may not be an important feature for you. Dimensions: You want to know that your clippers will fit safely and securely in your hands while you are cutting, so be sure to check out the dimensions to know whether or not the clippers you like are a good fit. Warranty: A warranty is a great sign that the maker believes their product will last you. But warranties can also be worked into the price of the clippers, creating a higher price tag up front for you. Now that you know what to look for, you can go find yourself the best hair trimmer! We recommend starting with our top and budget picks, they’re our best of the best. We’ve also spent a lot of time compiling a great, comprehensive guide for you, so be sure to check out each of our other eight picks to make sure that you’re choosing the best trimmer for your needs. Our top pick for the best professional hair trimmer is this awesome Andis Barber Combo-Powerful Clipper. This trimmer delivers a professional quality haircut, even if you’re not a professional. This clipper allows you to cut close for perfect styling. It includes fine teeth with comb attachments sized from 1/8”-1” and 1/16”-?”. This allows you to get a precise and direct cut regardless of what kind of style you are going for. These trimmers are powerful. They contain a magnetic motor that delivers superior power to your cuts. This clipper is ideal for trimming. Clipping, outlining or anything else barbering may throw your way. This clipper comes with a hanger loop that makes it easy to store these clippers. It is the perfect haircutting kit to help you get the best cut every time. This clipper comes with an adjustable blade clipper and a close cutting t-outliner blade trimmer. This is a great pick for anyone looking for the best hair clippers for men without breaking the bank. This trimmer comes with self-sharpening precision blades for smooth cutting through any and all types of hair. This means you’ll always get a good cut, regardless of what kind of where you’re working with. This clipper also comes with best guide combs, which allow you to get a great cut on many different lengths of hair. These clippers also come with an 8-foot long industrial strength cord. This allows you to easily tackle any and all haircuts without worrying about wearing out your cord. This clipper also comes with a premium storage case to keep all of your combs, blades, and your clippers organized and safe from harm. This clipper also comes with a five-year warranty, so you know that Wahl is confident in their product. This trimmer also comes with an adjustable taper lever so you can get a great look every time. 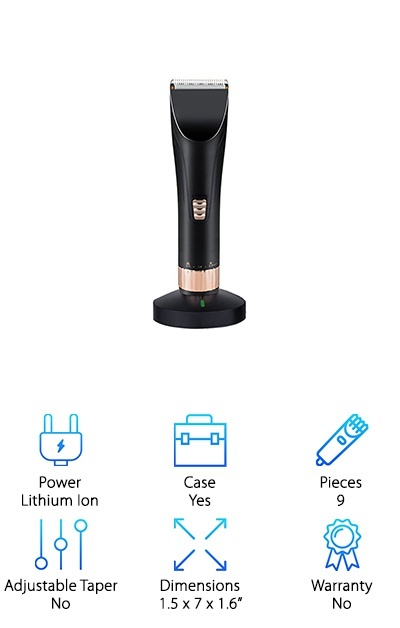 A close follower for the best hair trimmer for men, this great ECVISION Professional Hair Clippers Set comes with a high-speed lithium-ion battery to keep your clippers running for a long time. These clippers come with an oval ceramic titanium blade head that allows you to deliver efficient and long-term cutting. This blade will not get rusty or wear out after lots of use. 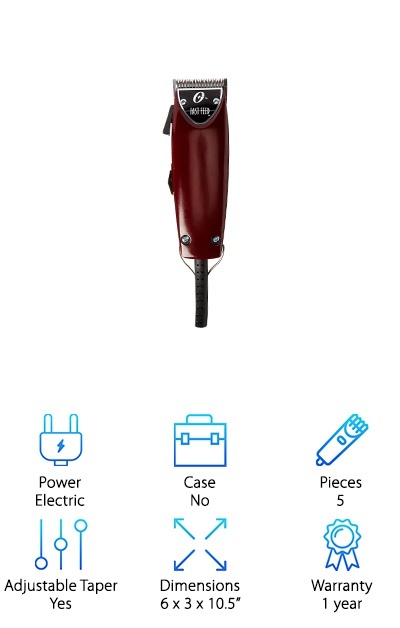 This trimmer also comes with a five gear fine-tuning that allows you to adjust the length. This makes it easy to do everything from shave completely to a light trim. 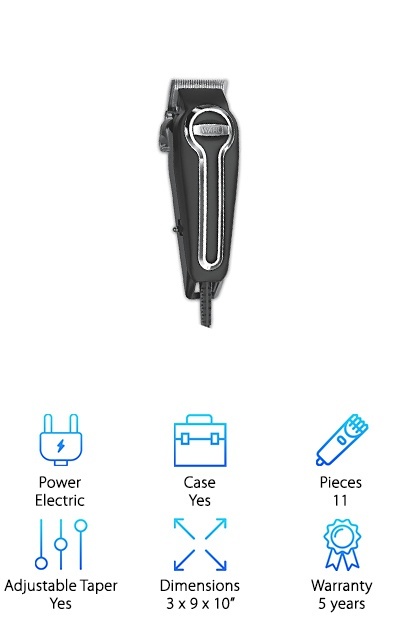 This trimmer comes with 8 different pieces of comb attachments. These allow you to customize your cut to match your style or your client’s taste. These clippers are designed to be ultra quiet, so you won’t have to worry about the constant buzz annoying you or anyone you’re styling. This makes it especially great for trimming babies or small children's hair. 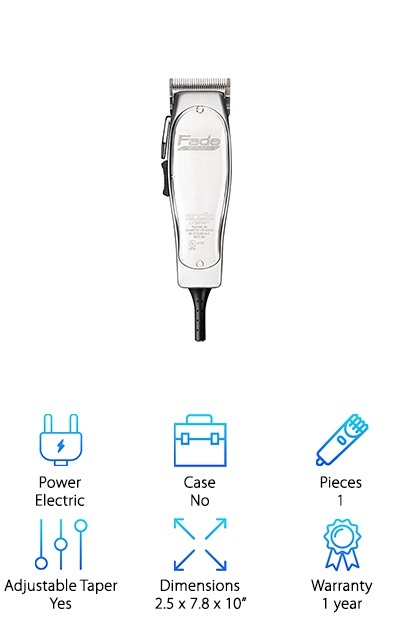 This is a great choice for anyone looking for some of the best rated professional hair clippers. These clippers are both powerful and easy to use, even if you’re not a professional. This clipper has a powerful, yet very quiet motor that allows you to cut your hair quickly and easily without being annoyed by the constant buzz and hum of the motor. This trimmer can be used on all types of hair, so it’s a great choice for everybody. It can even be used on wet or dry hair. It features an ergonomic design that fits comfortably in your hand without slipping, thanks to the textured grip. This trimmer comes with four guide combs- blending, ¼”. ?”, and ½”. It even includes a blade guard, lubricating oil, and a cleaning brush to help you keep your trimmer as fresh and clean as your hairstyle. This trimmer even comes in multiple colors, so you can blend it into your style. It comes in red, purple, light blue, royal blue, and a skull print. This clipper is an amazing choice for anyone looking for hair clippers for women. These clippers come with a very quiet design, allowing you to trim without worrying about the noise. It also comes in an attractive gold and black design that makes sure that it fits right in with all of the other accessories in your bathroom. It comes with a ceramic titanium blade that ensures it will last you a long time giving efficient and clean cuts. 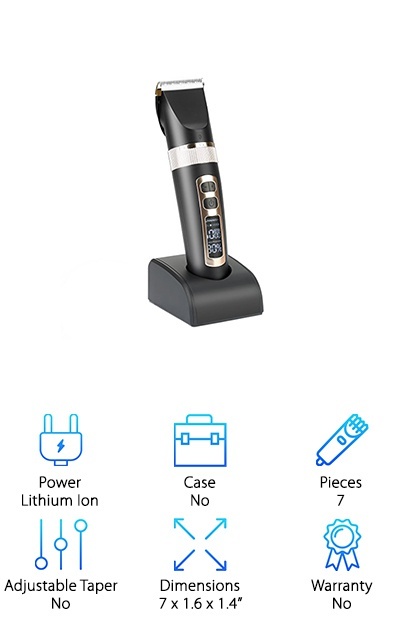 This trimmer also comes with lots of other accessories. These include a case, a cleaning brush, and two fine trimmers for touch-ups. It also comes with a convenient charging dock that allows you to easily charge up your clippers for the next use. This package also includes a hairdressing cape and five comb guides. These clippers are a great choice for anyone looking for something that provides everything you need for a basic trim and cut. These clippers are great for anyone looking for the best electric hair trimmer. This is a great all around barbering tool that allows you to style and shape hair efficiently. These clippers come with a fully adjustable lever which allows you to adjust the clipper blades. This removes the need for multiple blades to cut different types or lengths of hair. It comes with a magnetic motor that is powerful. It manages to stay very cool while in use, despite being very powerful and able to handle many different kinds of cuts and hair. The lever on the side allows you to easily adjust the level while you are cutting, making it easy to taper or style in lots of different ways. It comes with an aluminum housing that is lightweight but still durable and powerful. It comes with a high-speed motor that is designed for heavy-duty cutting, allowing you to conquer any kind of style. These clippers are a great choice for anyone looking for the best cordless hair clippers. These clippers deliver heavy-duty performance without sacrificing by using a heavy duty and cumbersome cord. These clippers offer steady control and come with an R shaped rounded edge design that prevents from accidentally hurting the skin of whoever you are trimming. These clippers are also made with a titanium blade which combines with a ceramic movable blade, allowing you to deliver efficient cuts. This also means your trimmer’s blade lasts for a long time and is very durable. These clippers are great for cutting your own hair or others. It comes with leveled combs that allow you to easily trim your own hair to a perfectly even cut every time. This kit also comes with trimming scissors to allow you to get every single hair in place. It also comes with a cleaning brush and four leveling combs. This clipper is definitely among the most advanced trimmers on our list. It comes with a unique LCD display that shows you the battery capacity, rotating speed, recharge alert, and oil alert. This shoots it to the top of our list for the best cordless hair trimmer. 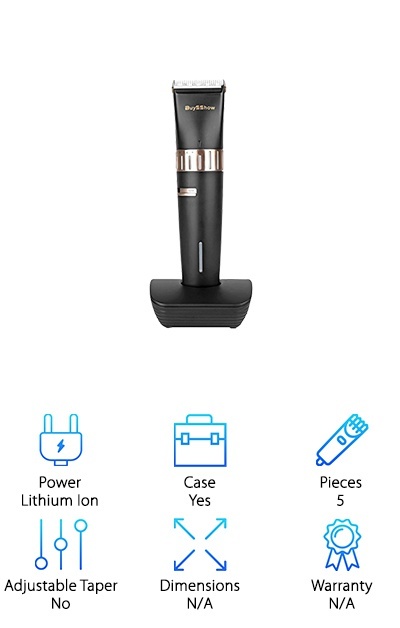 This trimmer comes with its own charging dock that allows you to easily keep it charged and out of the way. It comes with three different speed for all skill levels. This trimmer also comes with five different cutting sizes, allowing you to get the best cut every time. It is specifically designed to be able to cut everyone in your family’s hair. This means it comes with a powerful motor that still manages to be fairly quiet while in use. This helps you cut children’s hair with minimal fear on their part and on yours. This kit comes with a clipper, power adapter, cleaning brush, six combs, and a charging base. If you’re looking for the best clippers for men, these could be the ones for you. 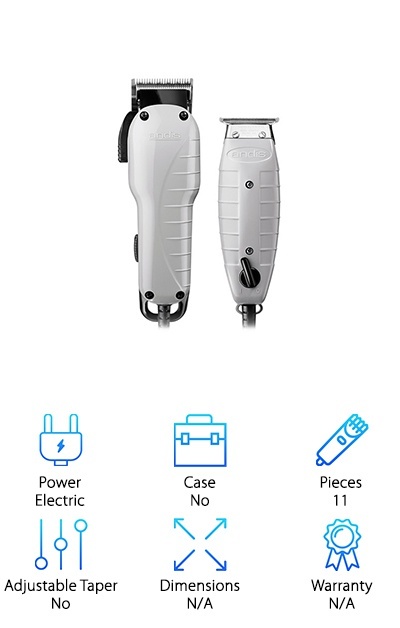 These clippers come with a two in one haircut knife that allows you to cut hair and style. The modeling knife allows you to easily style hair and create a great look without worrying too much about the clippers. This kit comes with three combs to help you get the ideal length and style every time. These clippers come with advanced technology that helps to reduce the noise to a quiet and easy interval. 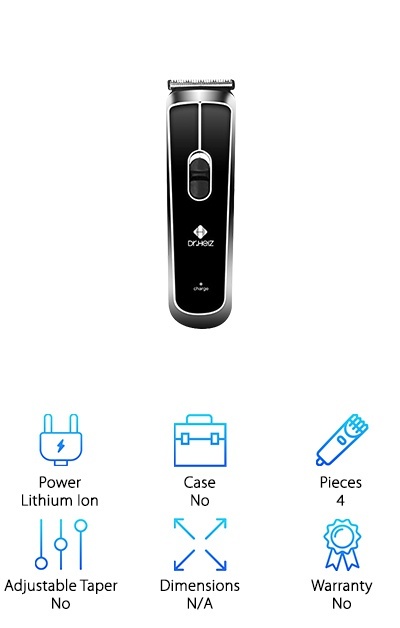 This trimmer is also wireless, allowing you to easily maneuver around any hair. This trimmer comes with an acute angle which allows you to achieve a perfect cut without accidentally nicking anyone. This kit comes with a power adaptor, cleaning brush, two limit combs, one sideburn modeling comb, a haircut knife, and a modeling knife. These tools make it easy to achieve the best cut every time. These clippers are a great kit for anyone looking for a great set of clippers that come with everything they need to be the best clippers for black hair and other hair types. 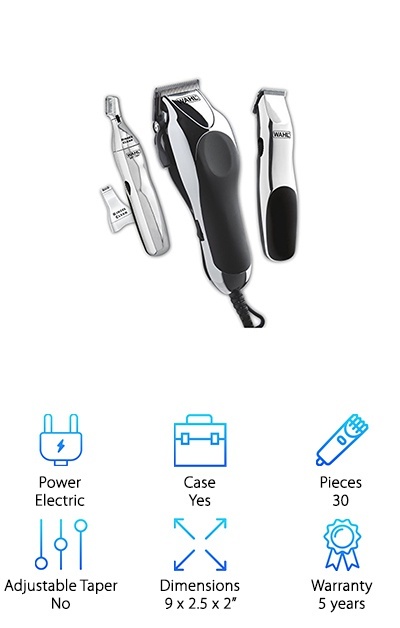 This trimmer comes with a 30-piece kit and is complete with everything you need to achieve the perfect haircut, no matter the hair type or desired style. This kit contains a multi-cut clipper, a cordless touch-up trimmer, and a cordless personal trimmer with two heads. These trimmers all come with high-carbon steel blades that stay sharp longer and remain strong and durable. This kit comes with a five-year limited warranty that allows you to buy with peace of mind, knowing your kit is protected. This kit comes with blade guards for all the trimmers, mirror, spray bottle, medium comb, barber comb, cape, 2 hair clips, scissors, cleaning brush, blade oil, soft storage case, left and right ear trim guide combs, eyebrow trim guide comb, ear trim guide comb, and 12 guide combs.